The first recipe is grilled chicken with fennel sauce. 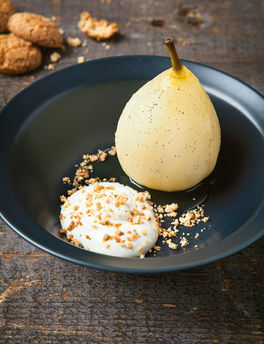 Fennel is one of my very favourite ingredients, so I couldn’t resist picking this for you, and poached pears is a classic dessert which the Hairy Bikers have paired with Italian amaretti biscuits. Three recent guests on my Soho Radio show have been healthy food advocates. Wendy, from online marketplace TheFoodMarket.com, introduced us to healthy treats, including broccoli crisps, while Lisa Roukin chatted about her book My Relationship With Food and brought in some of the raw-chocolate brownies she had made. The super-fit personal trainer, Matt Cho, told us all about his healthy eating and fitness regime, the Macro Lean Method. Place a chicken breast on the work surface, with the top side (the side that would have the skin attached to it) facing up. Put one hand on top of the chicken and take a sharp knife in your other hand. Slide the knife into one side of the chicken and slice horizontally until you are nearly, but not quite, through to the other side. Now, open up the chicken and press the centre flat – it will look like a cross between a butterfly and a love heart. Repeat with the remaining chicken breasts. Put all the chicken breasts into a bowl and season them well with salt. Whisk together the oil and lemon juice and pour over the chicken. Using your hands, rub the oil and lemon mixture into the chicken and set the bowl aside. Now wash your hands thoroughly. 8-10 minutes until it is translucent and almost tender. While the fennel is braising, finely dice the tomatoes and put a griddle pan to heat on the hob for several minutes. Turn up the heat under the pan of fennel and add the vermouth or white wine. Boil until it has reduced by half, then add the lemon zest and tomatoes. Season with salt and pepper and leave to simmer for 5 minutes. Tear the basil leaves and stir them into the sauce. Remove the pan from the heat. Arrange the opened out chicken breasts on the griddle. Cook the chicken for 3-4 minutes on each side until the pieces have charred lines across their surfaces and are cooked through. Serve with the sauce and garnished with a few of the reserved fennel fronds. Put the hot water and white wine in a pressure cooker with the sugar. Split the vanilla pod down the middle and add this, too. Put the pan over a low heat and stir until the sugar has completely dissolved. Put the lemon or lime juice into a large bowl and add cold water. Peel the pears, removing the cores from the base, and drop each one into the bowl of citrus water as you go – this stops the pears from going brown. When you have prepared the pears, strain them and put them into the pressure cooker. Close the lid, bring the cooker up to high pressure, then turn down the heat. Cook at high pressure for 6 minutes. Fast release the pressure and open the lid. Remove the pears and let them cool a little before serving. They are best at room temperature. Crumble the amaretti biscuits until they are the consistency of breadcrumbs. Serve the pears in individual bowls with a little crème fraîche sprinkled with the biscuit crumbs. Recipes from The Hairy Dieters Fast Food by Si King & Dave Myers (£14.99, Orion Books), photographs by Andrew Hayes-Watkins. To order your copy, call the Express Bookshop on 01872 562310, send a cheque or postal order made payable to The Express Bookshop to Express Bookshop, PO Box 200, Falmouth, Cornwall TR11 4WJ, or order online at expressbookshop.com.